An elaborate horror setting with plenty of effective scares but not quite enough to last the entire game. 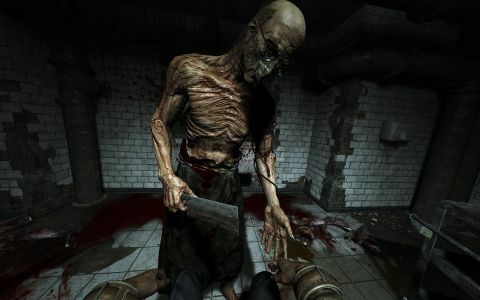 Outlast, the first-person survival horror game by Red Barrels, is dark. Not just in terms of its content, which features a gore-splattered insane asylum packed with murderous lunatics and their victims, but in terms of its lighting – or lack thereof. "You'll stumble across corpses, terrified inmates, insane doctors." Many of the corridors, rooms, basements, sewers and even outdoor areas you'll navigate are pitch black. The only way to see is by using the night vision setting of the video camera you've brought with you, which runs on a series of slowly draining batteries. As a panicky journalist investigating the asylum, you'll stumble across mutilated corpses, terrified inmates, insane doctors, packs of roving, disfigured madmen, and loads of incredibly familiar horror gaming tropes. You'll need to restart pumps and electrical breakers, restore power to elevators, locate relief valves to lower the water level before entering the asylum's sewer system, and, of course, there's a seemingly endless series of locked doors and their corresponding keys to find. This is in addition to the familiarity of the premise itself: an evil corporation sponsoring morally questionable scientific experiments gone horribly wrong. While it's all handled deftly, it's hard not to feel like we've seen most of this before. "It's like a nightmare version of Mirror's Edge." With no weapons to fight off the lunatics, you can hide – inside lockers or under beds – and watch as your pursuers either stalk slowly past to look for you elsewhere, or suddenly spot you, drag you from your hiding place, and tear you to pieces. Or you can run: vault over obstacles, leap across broken staircases, pull yourself into vents, squeeze between obstructions, and yank doors open and then barricade them behind you, all which feels fluid and natural, like a nightmare version of Mirror's Edge. When you're not running or hiding, you'll be scouring the building for spare batteries for your camera, for keys to unlock doors, or for the nearest exit. While initially nerve-wracking, this slow, painstaking search of the asylum begins to drag after a couple of hours, long after the tension drains from the game. Things pick up during the finale, which provides a welcome change of pace and scenery, and the game's conclusion is exciting and mostly satisfying. Still, with a couple of sloggy, repetitive hours in the middle, Outlast feels like the rare game that could stand to be a bit shorter. The most important question: is Outlast scary? Hell yes. It can feel overdone at times, such as during a chase, when loud, nerve-jangling music, the sound of your own panicked breath, and the growls of your pursuers all merge into one big, sloppy noise. In its quieter moments, however, Outlast can be terrifying, with subtle scares, wonderfully timed surprises, and a crushing sense of dread accompanying you as you inch through the darkened corridors, waiting for something – anything – to happen.